One of the things I love to see as a digital marketing advisor, implementor, mentor, and employee is a platform that is consistent. This is often overlooked in the SAAS space as most startups don’t make it past 3 years. Let alone consistently update their platform all the years in existence. That’s why I get excited, both as a user and employee, when I see a platform like ActiveCampaign with consistent monthly updates. Added ability to segment contacts based on if they have been sent a particular email. This feature in the segment builder appears under actions and displays as “has been sent”. Deal Personalization tags allow you to display the details of the deal owner to your contacts. Extremely useful for signatures that you want to display from someone on your team dynamically. And any outbound messaging to your prospects concerning the deal can now be personalized to the user that the deal is assigned to. This month Ontraport launched their new campaign builder. Two words describe the big announcement…all hype. I know that may seem harsh but just follow my logic. First off, I’m happy for Ontraport and that they have added a visual builder to their platform. I have a lot of friends and associates that use it with great results. Today it’s laughable for any platform to claim they do marketing automation without offering a visual builder (*cough* Mailchimp). So it was necessary for them to add that element to their tool. But to call that “the Future of Marketing”??! Really? Platforms like ActiveCampaign and Infusionsoft must be some of the most futuristic companies on planet earth because visual builders have been around for at least half a decade (GetResponse, Drip, and CampaignMonitor have had visual builders for at least a year now). For them to claim this as a move of the future just baffles me. Another thing that was prevalent was the members-only feel to the presentation. Judging from the comments most came from current users looking for a reason to stay. They were ecstatic (which they should be). But reading some of their responses (and blog posts later) the over hype continued. A lot of users/bloggers used words like “never seen before”, “not possible anywhere else”, “ground breaking”, etc. From what I saw it is nothing of the sort. There are some elements I’m interested in seeing how they pan out…like reporting. 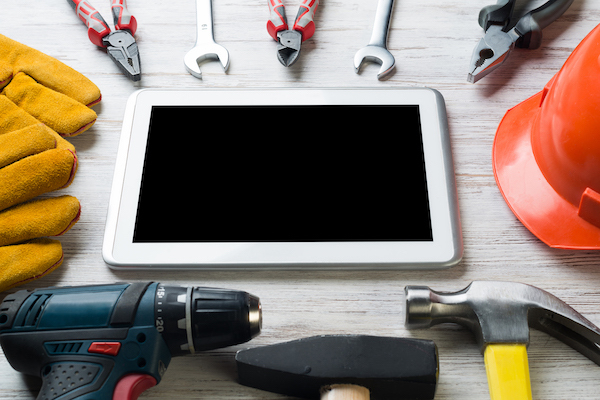 But as with any new technology Ontraport’s new builder will probably be riddled with bugs for the first year or so (which is expected with any major technology update). Call me a skeptic but I’ve been burned before by the company when they went from Office Autopilot to Ontraport. At the end of the day I feel like Ontraport is similar to Blackberry. It’s trying hard to stay relevant by claiming new features that existed for years in other platforms and by doing so strengthens its current user base more than expanding it. I do, however, think this makes them a bit more of a competitor to both Infusionsoft and Drip. Infusionsoft because of the all-in-one nature, and Drip because they have OntraPages now. Like I said, it’s a good move that will definitely help the platform moving forward, but to be as “revolutionary” as Landon claimed this needed to drop 5 years ago. But hey, like one of my mentors always says…“you’re slow, but worth waiting on”. Welcome to the future Ontraport, hopefully this time you can keep up. Simplicity is becoming a larger theme of mine. It is what sets apart the real from the fakers. Which is another reason why I had to laugh at myself this month for over complicating a process. I wanted to create a Zoom meeting every time someone scheduled via my Acuity online calendar. So I went straight to Zapier to do so. I thought that was good enough until one of my Mentorship students told me her Acuity sends a customized Zoom link in all Acuity outbound emails. For the life of me I couldn’t figure out how to do this with Zapier. Then I realized…Acuity has a direct integration with Zoom. Yessss! 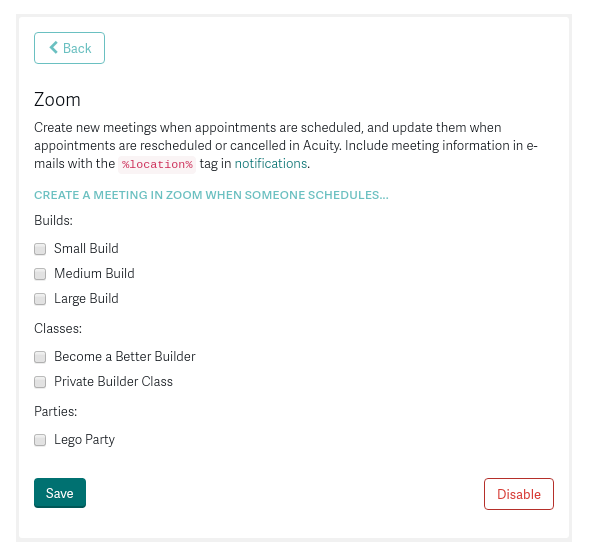 It was so easy to place my Zoom API credentials into Acuity and now I get to determine within Acuity which appointments should create a Zoom meeting automatically and which ones don’t. No Zapier required. Speaking of Zapier, in my quest to over complicate things I did run across a nice new feature in Zapier concerning Acuity. You can now determine your appointment type in the trigger action. 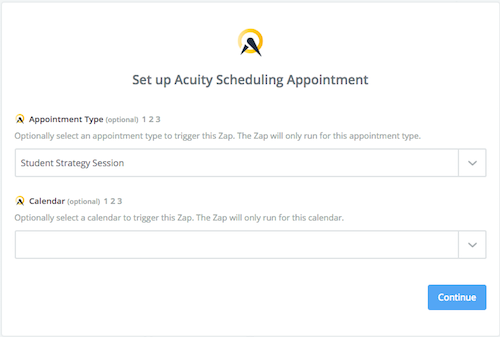 Before you had to choose “New appointment created” then use a filter action (only available on paid Zapier accounts) to determine which appointment type to trigger off. Now that filter action is no longer needed since you can determine which appointment from the start trigger. Which is very useful if you want to tag contacts specific to the type of appointment they schedule with you. Now if only Calendly will follow suit. I’ve been using the LearnDash WordPress plugin, exclusively, for all of my course offerings for a little over a year now. 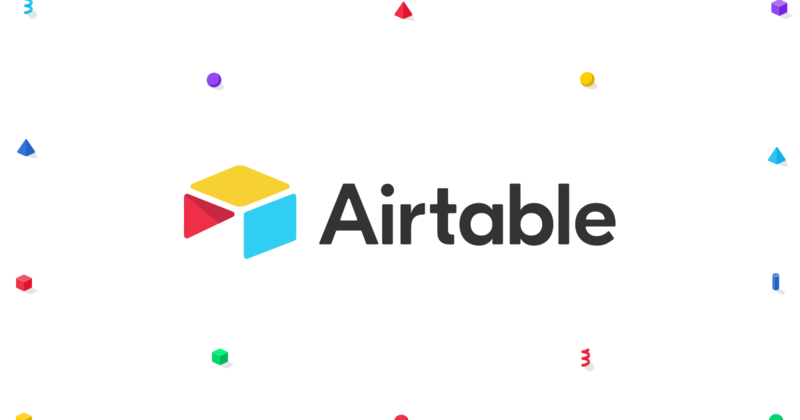 It provides me the level of customization and membership functionality that I cannot achieve in hosted platforms like Teachable, Kajabi, or Thinkific. I love how frequently Justin and his team add updates to the plugin. It’s one of the things I look for with any tool I’m investing in to run my business. This month they released a feature called Video Course Progression. In a nutshell this new feature allows the next lesson (or topic) video to play automatically after finishing the current lesson’s video. This behavior will also automatically mark the previous lesson as complete when the video has ended and the next video lesson begins. Think of YouTube playlist. Word is that Wistia has changed their pricing and it effects all accounts with no grandfathering. This means at a certain bandwidth cap you will start being charged no matter what plan type you previously had. 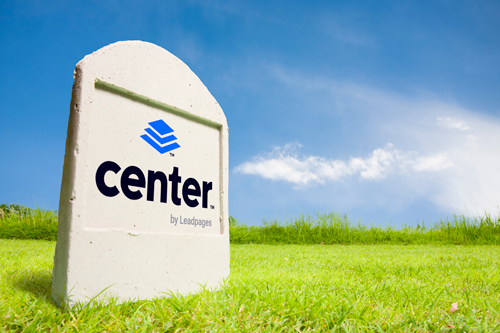 As many of you know, I was working at Leadpages at the time of the pre-launch for Center. Clay announced it at Converted ’15 and from there went into textbook presell formula. Needless to say…it was successful. I won’t disclose the amount pre-sold but just trust me when I say it was a sizable amount. Now that the product will never ship it illustrates the other side of pre-selling…shipping. That other side shows us that just because you can sell it doesn’t mean you can ship it. Now everybody who has invested to fund the development of the software is stuck with one choice…get Drip. Which is a deal if you were already looking to go that route. 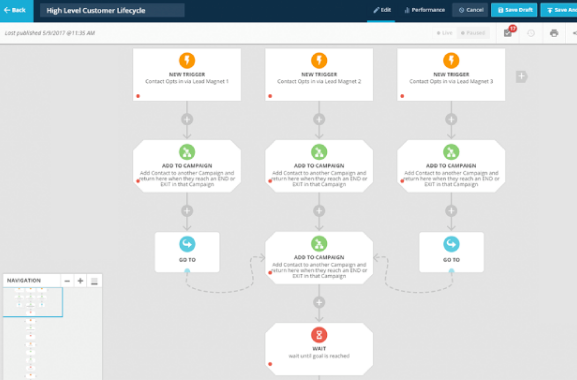 However, what about those that were using Center along with another marketing automation platform? They are the biggest losers in this choice since they are forced to migrate to Drip to take advantage of the software they funded to get developed (or use a more stable platform like FuzedApp). So although I’m a big advocate of pre-selling, just understand that the ability to ship the product is equally important as your ability to sell it. Shopify is a platform I haven’t used much but is definitely worth watching. They have one of the most comprehensive ecommerce offerings. From importing your Amazon products and fulfilling them via Shopify to standard ecommerce functionaity, Shopify can do it all. Adding to that existing list of features is new ability to integrate with Buzzfeed for your products to appear for sale. Shopify’s powerfull selling matched with the viral nature of Buzzfeed can be an explosive combo for your Shopify users. Running Live Webinars 2 Places at Once?? This month I’ve tried quite a few Facebook live applications. I’m almost ready to make my decision…more on that later (probably a separate post). In my journey I came across Zoom’s new ability to stream your webinars via Facebook Live. What this means is you can have your regular webinar registration and host the webinar on Zoom as usual. When you launch the webinar as a Panelists you’ll see an option to stream live to either Facebook or YouTube. I’ll leave it there and let your mind ponder upon the marketing possibilities functionality like this offers. Needless to say, I’ll probably end up using Zoom for Faceboook Live and potentially YouTube along with my regular webinar needs. You must have the webinars package to utilize live streaming with Zoom. One of my “automation brother in arms”, Ian Brodie, told me to check this tool out ConvertFlow that allows for on-site personalization. Haven’t had a chance to test it out but plan to soon. Drip added the ability to share workflows. What did I miss? Is there a tool or update that you think should be included in this month’s report? Let me know if the comments below. Would also love to hear about any tools you’re currently using and really enjoying. Drop a comment below!